In Microsoft Publisher, to start the Pack and Go Wizard, point to Pack and Go on the File menu, and then click Take to a commercial printing service. Follow the instructions on the screen from the Pack and Go Wizard. If a source file (a graphic or file you have linked to the publication) cannot be found, you can locate the original picture and update the link. When Publisher packs the files, it names and numbers the files and adds a .puz extension. The first file is named Packed01.puz, the second file is named Packed02.puz and so on. Publisher copies the .puz files to the destination folder or disk and prompts you to insert additional disks if needed. By default, Publisher packs files to drive A. If you want to pack them to another location, click Browse on the Wizard page and then choose a different drive and folder. 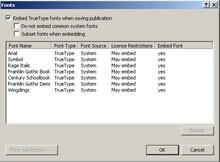 Make sure you select the options to embed Truetype fonts, include linked graphics, and create links for embedded graphics. This information is found in Commercial Printing Tools under Tools. Spot colors should be identified as Pantone colors. Change RGB colors to Pantone in the Commercial Printing Tool under Tools by going to Color Printing.